1. Combine ingredients into cocktail shaker. Adjust amount of Lychee Puree to desired burn. Lychee should complement the burn of the rye whiskey, not diffuse it. 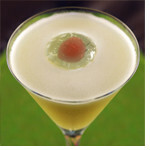 Shake with ice and strain into martini glass. Garnish with a strawberry frozen inside of an ice cube.